Urtica Urens (the small nettle). Photo by H. Zell, released under CC BY-SA 3.0. Courtesy of Wikipedia. 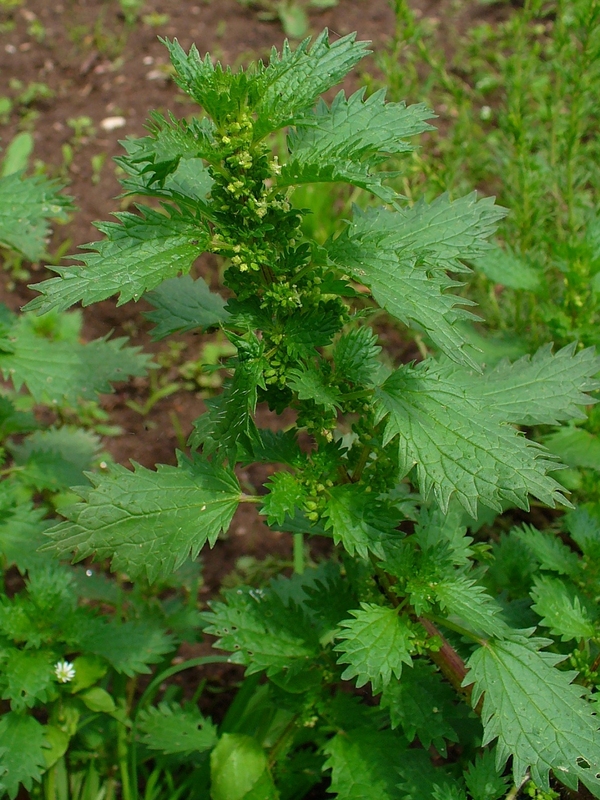 Many cultures, specially East-European and North-African, use nettles in their cuisine, as soups, creams, or teas. Nettles’ taste resemble spinach. Now Doukkali et al. (2015) discovered a new use for the plant. The authors harvested Urtica urens from north Morocco, dried the plants, and prepared a methanolic extract (see p. 2 for the procedure. Don’t drink methanol!). Then, they gave the extract in 3 different doses to mice and assessed its effects in two anxiety and one locomotor test against saline (the control) and diazepam (Valium), a powerful anxiolytic from the benzodiazepine class. Like diazepam, the plant extract had anxiolytic properties, but unlike diazepam, it did not induce any locomotor effects. And this is where the big thing is: ALL benzos on the market have significant side effects in the form of drowsiness, impaired coordination, sedation and so on. Having an anxiolytic without motor impairment would be wonderful. This is a short, simple to read paper, clearly written, and covers some classic aspects of new drug discovery (like dose-response and lethal dose assessment). The reasons why I think it did not make it to one of the big journals is the small sample size, the relatively moderate effect, and the lack of identifying the active compound (there are virtually no straight-forward behavioral studies published in Nature or Science any more; you’ve got to have the molecules, or proteins, or cells, or what-have-yous as proof that you mean hard-science business). Or, the fact that it does not have any graphs, all data is presented in tables, which I personally enjoy, as it is oh so easy to manipulate with a graph; and the fancier looking the image, the better chances few people get it anyway. Give me tables with standard deviation any day, as I suspect is the position of the authors of the paper too. But, for the visually inclined, I made a Fig. with some of their data, took only 15 minutes in Excel. Fig. 1. 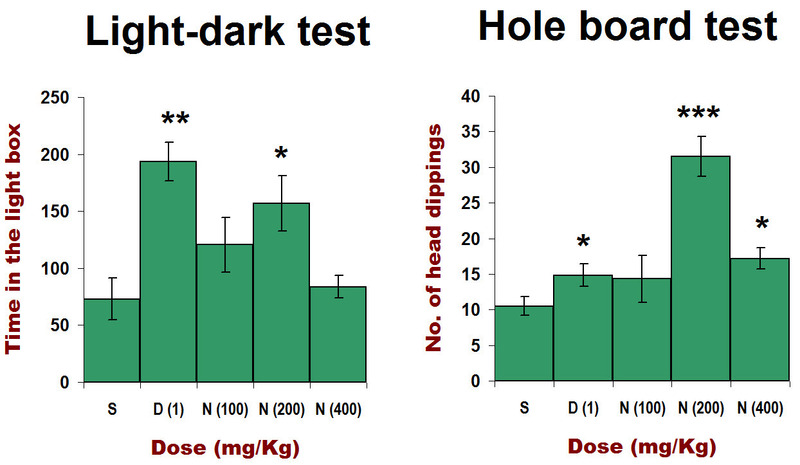 The effect of saline (S), diazepam (D), and nettle extract (N) on the light-dark test (left) and hole board test (right). Data from Doukkali et al. (2015) , graph by Neuronicus. Or, not to put a too fine point to it, the authors are from Morocco, so they don’t come shrouded in the A-list universities glamour. In any case, the next obvious step is to isolate the active compound and replicate its anxiolytic effects on other tests and other species. Posted on October 16, 2015 March 12, 2016 by NeuronicusPosted in 2015, Anxiety & Stress, Behavior, RodentsTagged 2015, anxiety, Hole board test, Light–dark test, locomotion, nettles, pharmachology, Rota rod test, Urtica urens. Previous Previous post: Really? That’s your argument? !